Abstract base class for match spies. The subclasses will generally accumulate information seen during the match, to calculate aggregate functions, or other profiles of the matching documents. Virtual destructor, because we have virtual methods. The clone should inherit the configuration of the parent, but need not inherit the state. ie, the clone does not need to be passed information about the results seen by the parent. If you don't want to support the remote backend in your match spy, you can use the default implementation which simply throws Xapian::UnimplementedError. This default implementation returns a generic answer, to avoid forcing those deriving their own MatchSpy subclasses from having to implement this (they may not care what get_description() gives for their subclass). Unserialise some results, and merge them into this matchspy. The order in which results are merged should not be significant, since this order is not specified (and will vary depending on the speed of the search in each sub-database). serialised A string containing the serialised results. Return the name of this match spy. This name is used by the remote backend. It is passed with the serialised parameters to the remote server so that it knows which class to create. Return the full namespace-qualified name of your class here - if your class is called MyApp::FooMatchSpy, return "MyApp::FooMatchSpy" from this method. Register a document with the match spy. This is called by the matcher once with each document seen by the matcher during the match process. Note that the matcher will often not see all the documents which match the query, due to optimisations which allow low-weighted documents to be skipped, and allow the match process to be terminated early. doc The document seen by the match spy. wt The weight of the document. 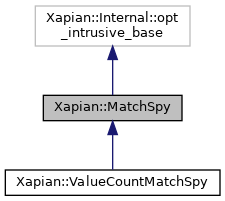 You can hand ownership of a dynamically allocated MatchSpy object to Xapian by calling release() and then passing the object to a Xapian method. Xapian will arrange to delete the object once it is no longer required. Serialise the results of this match spy. context Registry object to use for unserialisation to permit MatchSpy subclasses with sub-MatchSpy objects to be implemented.